I backed the Pebble on Kickstarter, but mine hasn’t shipped yet. But if the best smartwatch is the one you have with you, then for me, the MetaWatch Frame is the best smartwatch around—because it’s already on my wrist. 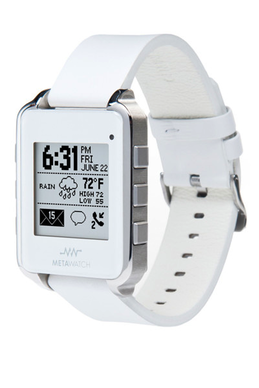 MetaWatch sent me two of its $199 Frame watches, one in black and the other in white, and while I'll still happily welcome my Pebble when it arrives, the wait is no longer painful. I'm awfully pleased with the Metawatch Frame. The Frame’s face is a solid, weighty slab of stainless steel. The face is two inches tall and 1.5 inches wide, though the actual display is smaller—just about one inch square. The LCD display—96 pixels square—looks great in dim light and okay in brighter settings. 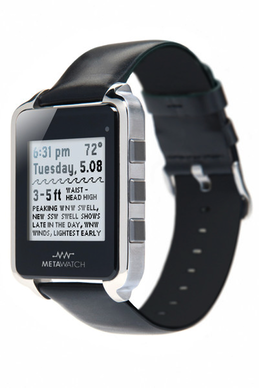 MetaWatch calls it a “sunlight-readable, reflective mirror display.” The display is … odd. It works, and I can read the screen whenever I need to, but the mirror backing sometimes means I need to angle the watch a bit to make text more readable. At the right angle, the text is sharp and dark. At the wrong angle, it looks pale and washed out. The Frame sports six identically-shaped buttons, three per side. Mastering them is a quick process. The top left button controls the watch’s built-in top light; a backlight would surely do even better—the top light doesn’t uniformly or wholly illuminate the screen—but it’s enough to see the watch screen in dark situations. The middle left button enters music mode. The music controls are sparse: The screen shows the name of the currently selected (or playing) song, along with the artist—or at least what fits of each; it tells me, for example, that Satisfaction is by “The Rollin…” In music mode, small icons indicate what the other buttons will do. The lower left two buttons are play and next, and the lower right two buttons adjust volume up and down. The top right button exits music mode. The music playback controls work fine. You’ll want (and need!) to make your playlist or album selection ahead of time, on your device, because you can’t navigate playlists and albums from the Frame itself. The lower left button displays a screen with status information. Icons indicate whether Bluetooth is turned on, whether the watch is successfully paired, and its remaining battery life. That screen also shows the watch’s current firmware version; I tested using version 1.35 of the MetaWatch firmware, which was released this week. The button at the upper right displays the watch’s last received notifications again. The middle right button toggles through the watch’s four home screens—more on those in a bit. And the lower right button enters a watch-specific menu for turning Bluetooth on or off, toggling a seconds indicator, inverting the display, and disabling or enabling a vibration alarm for when your phone and the watch disconnect. That last feature is a helpful way to help prevent you from forgetting your phone; if you walk too far away from it, the watch loses its Bluetooth connection which causes that alarm vibration, so that you hopefully realize your error. There’s also an ambient light sensor on the Frame. The watch doesn’t actually make use of that sensor out of the box, though third-party developers can use it. On the back of the watch face are some tiny nested pins. Those are used in tandem with the charging clip—yes, clip—to top off the watch’s battery. The alligator clip is usable, though it takes a little more effort to center properly than the magnetic charging cable the Pebble employs. The clip uses the included Micro-USB cable connected to a power source you provide. Both the clip and the cable match the color of your Frame. The Frame is rated 3ATM for water resistance, meaning it’s splash and rain resistant but shouldn’t go in the shower, bathtub, or swimming pool with you. I, however, would be happy to. The Frame works by pairing to your iPhone or Android device via Bluetooth 4; I tested it with my iPhone 5. Android makes the connection process a smidgen simpler, but the iPhone pairing process is simple enough to go through: You pair both within the app and then within your iPhone’s Bluetooth settings as well. You can customize four different screens for the Frame, and you customize those screens within the app. I’ll describe the process using the iPhone app here, since that’s what I used. The Frame’s face divides into a four by four grid. Using the app, you can configure how those grid spaces are used on each of the four separate home screens. I chose to set one with a 2x1 clock, a 1x1 calendar, and a 1x1 weather widget; the second screen has a 2x1 clock (again) with a 2x1 weather widget; the third has a 1x1 clock, a 1x1 iPhone battery status indicator, and a 1x2 stock widget; and the final screen is a 2x2—full-screen—clock. My setup doesn’t use options like a 1x2 or 2x1 calendar widget, or a 1x1 Chinese Lunar widget. Configuring these widgets is a bit clunky within the app, but not something you need to revisit often. You can drag them around the in-app watch face, just like reorganizing app icons. If you tap on a given widget, you can tweak its settings, though some—like the clock faces—have no settings at all. (The full-screen watch face with the latest firmware I tested shows a nice, tall digital time display, with the date beneath it. That’s far better than the tiny time with dolphins leaping around it in prior versions of the full-screen clock.) 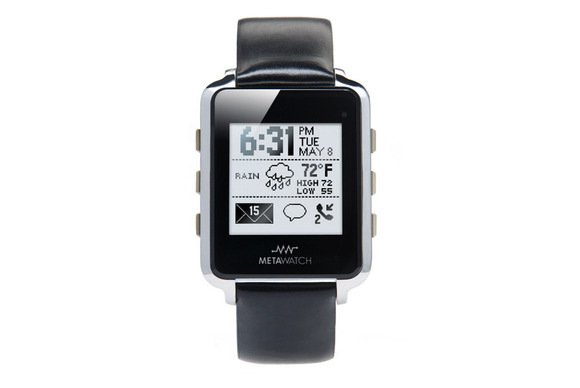 I’d love Pebble-style alternate watch faces, though. I’d also like more control in general: I can’t, for example, specify which calendars the MetaWatch should look at to push to the Frame. So when it shows me just that, say, Jason Snell will be out of the office all day tomorrow, I wish it would instead look at my own calendar and not the work vacation calendar I’m also subscribed to. The only reason I have two watch widgets installed is because the wider one—which shows both today’s and tomorrow’s forecast—doesn’t show the current temperature. I needed to add the smaller one too, since it gives me that data point. No other apps yet work with the Frame on the iPhone. MetaWatch expects to open the iPhone version of its API soon, and it’s clear that the team continues to work on adding functionality to the watch’s software. The Frame initially shipped with Facebook, Twitter, and email notifications all listed as “coming soon.” We’re still waiting for two of them, but email notifications now work—sort of. You can add exactly one Gmail account into the MetaWatch app, and the app will check for new emails to push to the Frame as frequently as every 15 minutes. On my wrist, the Frame is a delight. I like the way it looks, and appreciate that it’s not massively oversized or gaudy. It’s bigger than a typical digital watch, but not obnoxiously so. The weather, stock, and calendar widgets all update on their own. It’s very cool to look down at my wrist and see that my next meeting is a call with a colleague, and that it’s 45 degrees outside—along with the fact that it’s, you know, 2:57 p.m.
I’m also a big fan of vibrating notifications on my wrist. I miss iPhone vibrations in my pocket all the time, and I often feel phantom pocket vibrations when in fact there are none. My wrist isn’t subject to those issues: When the Frame vibrates, I know it. And since it doesn’t receive every iOS notification, it’s not buzzing all day long. It vibrates about genuinely important stuff: meeting alerts, incoming text messages, Caller ID, and emails. I can glance at my wrist and see what’s notifying me without needing to grab my iPhone, and I really like that. I noted that when I received an iMessage that was just a photo or video, the Frame’s display indicated that I’d received a message, and from whom, but just showed a blank message. I’d appreciate a note of some sort indicating that the received message contained some sort of attachment. The MetaWatch Frame isn’t perfect. But it’s a fine-looking, well-built watch, and the parts that need improving can be improved with software updates. If, however, you told me that the Frame would never do anything more than it could do now, I wouldn’t regret the purchase for a moment: I love the notifications on my wrist, and the data on the Frame’s screen. It’s a great device that feels like the future. This story, "Review: The MetaWatch Frame is a very cool smartwatch" was originally published by TechHive.